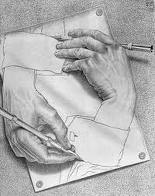 I’ve read that one of the things that made Leonardo da Vinci so creative is that he essentially taught himself to be ambidextrous. Everything he did with his dominant side, he tried to replicate on his non-dominant side. That made him more dextrous (so to speak) but also generated new neurological connections in his brain. That, in turn, may well have made him more creative. I’m not sure about my creativity but I’m trying to do as much with my left side (my non-dominant side) as with my right. I’ve moved the mouse to the left side of the keyboard, I put keys in locks with my left hand, and I emphasize exercises and stretches that work my left side. My trainer, Alison, says that this will help “recruit new muscles” — that is, muscles I don’t use very often. I can use all the new recruits I can get. I have to believe that this will also help my MS by building new connections in my brain. So, as they say, I’d give my right arm to be ambidextrous.